Microsoft Azure is a solution of computing products and services and cloud infrastructure not exclusive to Microsoft brand. This allows to create a Linux server for web services that communicate with Microsoft SQL Server databases on the same infrastructure or in separate services interconnected by virtual networks. The advantage of Microsoft Azure is its intuitive management very well documented and you can try at no charge. Microsoft offers three programs to trial/work with Microsoft Azure at no charge. Warning Azure Credits may not be used to purchase Azure support plans, Visual Studio Team services, third-party branded products, products sold through Marketplace, or products otherwise sold separately from Azure. Not for resale. In order to use the Microsoft Azure is mandatory to have a Microsoft account. The Azure portal lets you trial the Azure for a month with a monthly credit of 200 USD is required a credit card to activate the subscription. To create access between on the Azure and click 'Start free'. 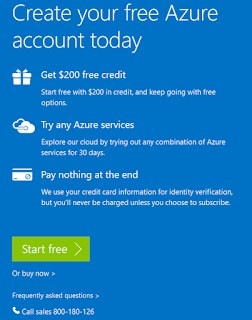 Azure ask for credit card information on signup strictly for verification purposes. You will not be charged on a free trial unless you explicitly decide to upgrade your services. Will be transferred to a new page to create the Azure subscription. 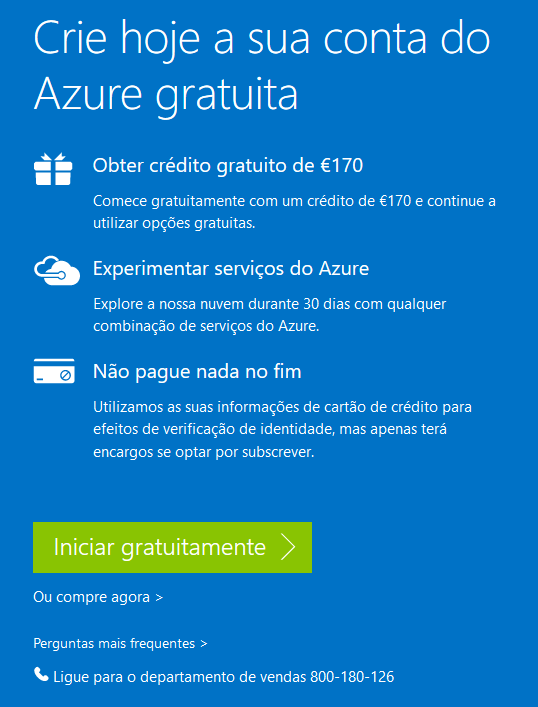 Is a program for developers where you can trial Azure during 1 year allowing more duration than the previous ones but only have a monthly credit of 25 USD and no credit card is required. The operation is identical to the IT Pro Cloud Essentials. This three programs cannot be using at the same time. Summarized the programs offer the same solution but with a different duration and monthly credit. If you spend the monthly credits you may not use any paying service. You can only use the free services.